Cowon, makers of audiophile digital audio players like the D2 and S9, is teasing their new diminutive flash player, the E2. But what to make of this "circle + square" slogan? 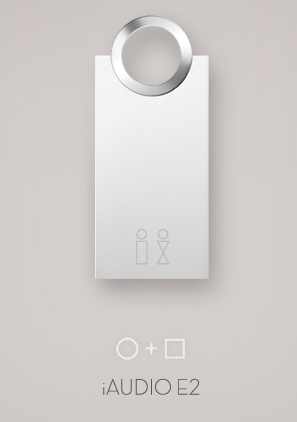 Since we don't know anything about this keychain-esque DAP, we're left to guess based on the interesting ad, with its repetition of the "circle + square" tag. Is it a lost-in-translation attempt at our "square peg in a round hole" idiom? A nod to the design of the gadget itself, which is, in fact, a circle combined with a square? A hint at the future aesthetic of Cowon's players (which have certainly been more attractive lately; compare the blocky utilitarian square of the D2 with the sleek curves of the S9)?